Lietuvos vyrų rinktinės kapitono P.H. 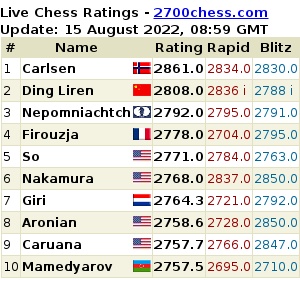 Nielsen nuomonė apie Lietuvos ir Azerbaidžano 2 vyrų rinktinių mačą: Azerbaijan 2 is an interesting team with talented young grandmasters. Strong players with aggressive styles, and obviously an interesting challenge for our team, where we can only positively surprise. To an extend it is going to be a battle of experience vs. youth. Strangely enough I do not know the players that well on the chess-board, but I faced them numerous times in the football match organized at the gashimow Memroial in Shamkir, where the youngsters was invited to play the B-group and get experience. Very much looking forward to todays match!